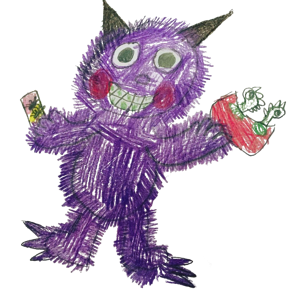 By December 2016 we had our first monster story, but we didn't know what the monster should look like yet. We decided the only logical thing we could do for a children's book was... to ask children themselves! And boy, they delivered! More than 50 children from Fitzjohn's Primary School in London gathered to listen intently to the story. They were then asked to draw the monster in the story. After several nail-biting days, where some of the team almost lost a few fingers, this resulted in picking one final winner: Alex, aged 7. But there were 5 other monsters who were given a secret spot in the book as well. Will you be able to spot them all? View all other pictures that were drawn for the competition on our Instagram page here.